Postcard with DVD featuring beautiful Maine Swedish Colony. A 24 minute miniDVD is attached to a postcard that can be sent as a greeting and a gift for only the price of a first class stamp. 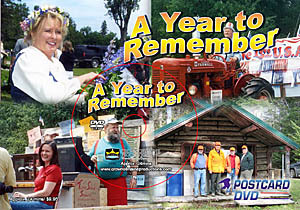 Post Card DVD from Maine Swedish Colony. "A Year To Remember" captures an unforgettable year for Madawaska Lake, Stockholm, New Sweden and Woodland. There are highlights from ice fishing at the lake, a housewarming party at Stan's, Midsommar with Birgitta Whited Anderson, Stockholm's 125th Parade, the "Settling Stockholm" Pageant and the construction of a Knockout '42 replica hunting camp. Re-live the fun and excitement of this special year with this 24 minute Postcard DVD.